Christmas tree crafts can be made from just about anything that you find in nature. The one pictured here is made from pinecones. You can make a family outing and go and collect pinecones or whatever you will need for your crafts. This way the kids feel like they have helped to make these handmade crafts. It is very easy to take pinecones and turn them into Christmas ornaments. All you need is a little imagination and some craft supplies. Kids can help make this cute ornament. In this kids craft it might be better if they use craft glue instead of the hot glue. They can be made any size as well as ornaments for the tree. The kids could have a party and each child could make some to take home with them. Draw a Christmas tree shape onto the cardboard. You can cut it from a soap box or any kind of box that you have. Pull the pinecone seeds off and start gluing them on. Start at the bottom of the tree and be sure to overlap the next row. After it is dry, brush some glue on each seedpod and sprinkle glitter on them. Donâ€™t make the glitter solid. You just kind of want a hint of glitter on each pod. Glue a few red berries on for decoration. Make a loop with about 4 inches of ribbon. Glue the end to the top of the tree. Now make a small bow with some more ribbon and glue it onto the top of the tree to hide the ends of the loop. You can add some leaves and red berries on top of the bow. Your Christmas ornament is now ready to hang. They are a lot of fun to make and kids can make some and give as gifts to their friends. 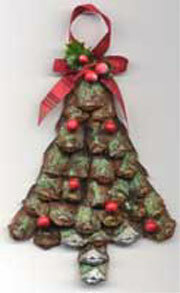 There are many Christmas tree crafts and regular crafts that you can make. Please check out the ones I have listed on this page.